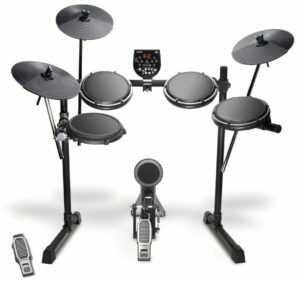 Looking For the Best Electronic Drum Set For The Money? Here’s a look at our favorites, including our top pick the – Alesis DM6 USB Kit. Electronic drum kits are a great solution for drummers or aspiring musicians who are living in apartments or with roommates. 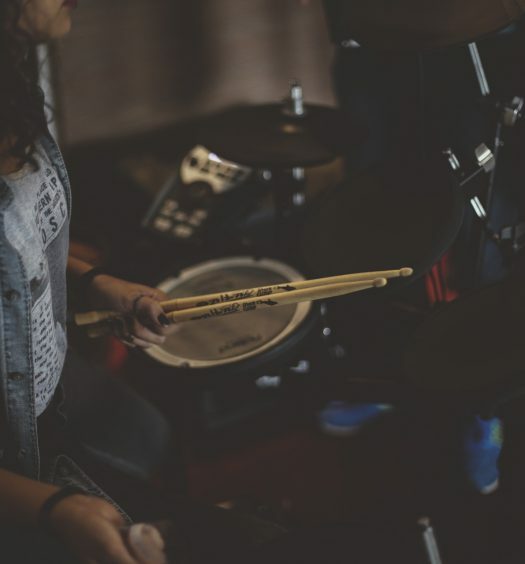 It’s difficult to find a home where you can play drums consistently, and oftentimes drummers will have to rent a practice space just to hone their skills. 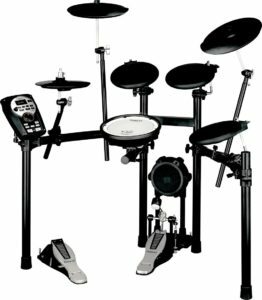 Electronic drum sets are a perfect solution for this inherent noise problem associated with drums, and buying a kit that has pressure sensitive pads ensures that your electronic drum set feels like the real deal. That’s one of the huge differences between a good electronic drum set and a cheap one. The electronic drum heads have to be able to pick up the velocity of your hits, or else everything is going to have a similar feel no matter your dynamics. However, if you’re just looking to buy an electronic drum set for occasional use, maybe at night while your significant other is going to sleep, then getting a cheaper electronic drums set without pressure sensitive heads will save you some money. Now, let’s take a look at the best electronic drum sets for the money, keeping in mind that you want to get as many different tones and capabilities out of this kit as possible for your money. Price – This is the most important because you don’t want to overspend. Get yourself an affordable drum set with all of the features you need like impact sensitive heads for dynamic playing, and if you fall in love, then upgrade your setup to a more expensive professional rig with a more realist feel. Quality – We make sure that all of the electronic drum sets on our list are highly sophisticated units. We even compound reviews from different sites and make sure people all agree about the high quality of these drum sets. Usability – Some electronic drum sets can be cumbersome or non-intuitive to use if they’re too small. 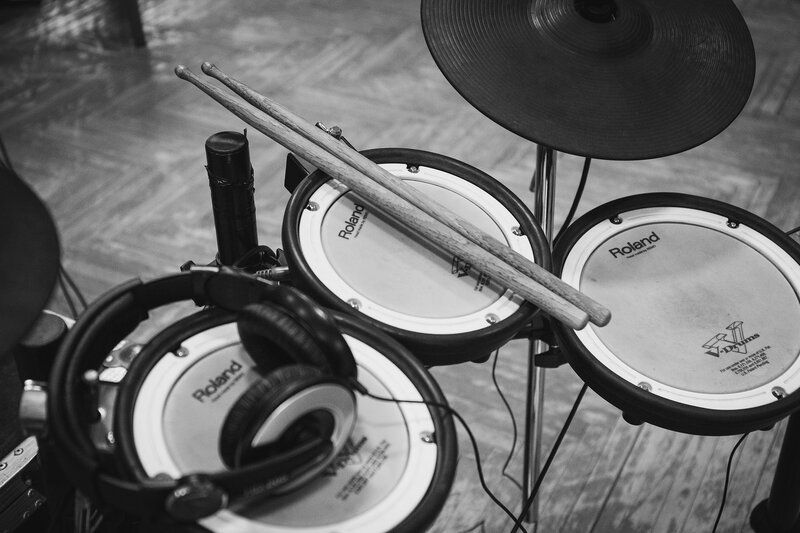 We prefer that our electronic drum sets feel as close the real thing as possible, that they’re fairly portable when possible, and also offer a smooth playing experience for the drummer. This impact sensitive kit, the Alesis DM6 USB Kit is perfect for those who want a realistic drum kit experience at a reasonable price. There are so many Alesis kits to choose from, and the Alesis DM6 is right in the middle of all those choices. You get all the best features of the high end kits, and also everything in general that you need to practice and perform. 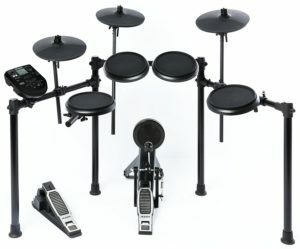 The Alesis DM6 is the perfect drum set for anyone who wants to own a practice kit for drumming at late hours, or who wants to see what the electronic drum set world is all about without breaking the bank. Impact sensitive drum heads is a must when it comes to electronic drums, and the Alesis DM6 pulls this off remarkably well. Now, if you’re looking for the absolute best, period, then the Roland TD-30 is the ultimate electronic drum kit solution. However, this particular electronic drum set comes at a hefty price so it’s reserved for serious drummers who want the quality of their expert level acoustic kits in an electronic form. Make no mistake about it, if you’re a beginner then do not start off with this kit, because the cost of the Roland TD-30 is just too high for your skill level. But, if you’re a touring musician who wants to keep up their chops when you’re at home and off the road for example, then the Roland TD-30 is likely your best bet to that path. The technology of Behavior Modeling is what makes this kit so expensive, Behavior Modeling produces accurate and expressive play-ability that the professional drummer expects. There’s a V-Edit mode to edit any tones and sounds on this kit, additionally there’s an ambience fader with room ambience and room mic simulation algorithms. There’s not much else to say about this kit, this is the end all be all of electronic drum kits, and whether or not you’re ready to harness it is up to you. The Alesis Nitro Kit is a #1 best seller on amazon for a reason, it’s one of the most affordable kits with all of the features you’d expect still packed in to this compact package. The Alesis Nitro Kit features dynamic and comfortable pads for a natural feeling stick hit, a dual zone snare, and three single zone toms. Cymbals on the Alesis Nitro Kit feature a choke capability for realistic cymbal chokes and rests. Additionally the bass drum kick is included with this kit. The Roland TD-11K-S is the perfect kit for intermediates to experts. This kit has the impact recognition you need for serious playing, as well as the compact size if you want this kit to be portable. The snare features a mesh head for a more acoustic feel. The kick pad also feels natural, and pretty much all around this compact kit feels natural because it is built deceptively smart while still retaining all of the features you expect in a high end electronic drum kit. One of the cons about this kit is that it doesn’t come with a bass kick, and the cymbals could use more dynamics. The pros are the drum kit’s lightweight as well as the feel of the snare, so this is really the perfect kit for a band looking to expand their sound live, or even someone with a mobile lifestyle who wants to keep their chops up. 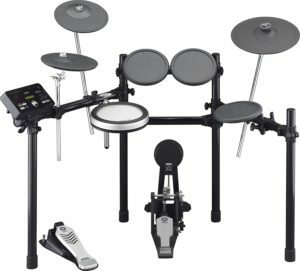 Lastly in our electronic drum kit buyer’s guide, it’s the Yamaha DTX522K, this is another great kit for late beginners all the way to advanced intermediate players who want to practice at night, or anytime at all really without disturbing roommates. Some great features about the Yamaha DTX522K are the 3 zone ride, crash, and hi-hat cymbals meaning their is a different sound depending on where you strike the cymbals. The snare on the Yamaha DTX522K features the same three zone technology as well as boasting a realistic feel, expressive dynamics, and the ability to do rim shots on the edge. The one con about this affordable Yamaha kit is that it does not include a kick drum pedal so you’ll need to buy one separately. Additionally, the cymbals all have the much beloved realistic choke feature so you can stop the chime on a dime. 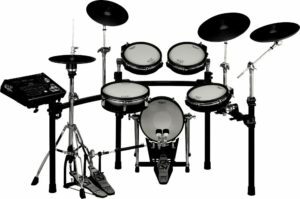 Electronic drum sets can be expensive, but if you ask the drummers who have switched to a high end electronic drum kit, you may be surprised just how much they love their electronic kits. Ultimately the choice is yours, and we hope that our buyer’s guide had all the necessary information that you needed to make your decision. There’s so many great electronic drum sets out there, and it really all comes down to how much you’re willing to spend. If you know it’s what you want, then go all out on the expensive Roland professional kit because it’ll last a lifetime and set you apart from the other drummers in your area.